Beaches. There is a wealth of sandy beaches in Pembrokeshire. Monkstone the pictured beach is about one mile away and is secluded even in the mid-summer months because there is a bit of an uphill walk back. But many visitors say it was worth it. But the main beach in Saundersfoot near the harbour is also about one mile away for those who like a more relaxed walk and a car park right on to the beach. You can add three beautiful beaches in Tenby and still on the southern part of Pembrokeshire there is Manorbier and Broadhaven to name just two and on the northern side there is Broadhaven North, Whitesands Bay and many others. Oakwood one of the major theme parks in the UK. Oakwood is about 5 miles away. Click on the picture to visit Oakwood website. home to a magnitude of sea birds and marine mammals. Click on the picture to visit Aquaphobia website. A great day out for all children especially the young ones. Folly Farm is about 3 miles away. 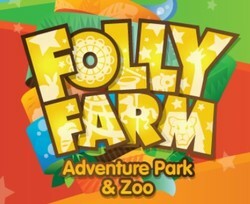 Click on the picture to visit Folly Farm website. Manor Wildlife Park is now an all weather attraction. Its 3.5 miles from Mount Pleasant. Entrance to Heatherton is free and then you can buy books of tickets to choose the activities you want. Its just 3.5 miles from Mount Pleasant. See their website by clicking on the picture. 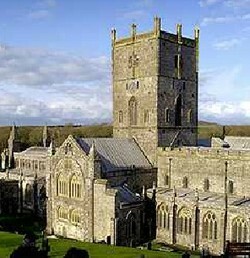 St. David's Cathedral. A wonderful sight to see. with some of the most beautiful views in the world. short as a few hundred yards at the nearest point. Tenby Male Choir are one of the most popular male voice choirs in Wales and thousands of visitors enjoy the regular concerts at St. Mary's Church or St. John's Church and other outdoor venues. Details are on the choir website here. Mount Pleasant is ideally situated to visit either Saundersfoot Village or Tenby town by car, bus, or even by bike or on foot. Click on the links below to see both lovely places.